QUALITY ALL-IN-ONE HIGH-DENSITY MEMORY FOAM - Our cushion won't flatten like other similar cushions. It is carefully crafted to ensure that it retains its shape to provide the best, long-lasting support! Additional features include: NON-SLIP rubber bottom grip and MACHINE-WASHABLE and removable velboa fabric zippered cover. 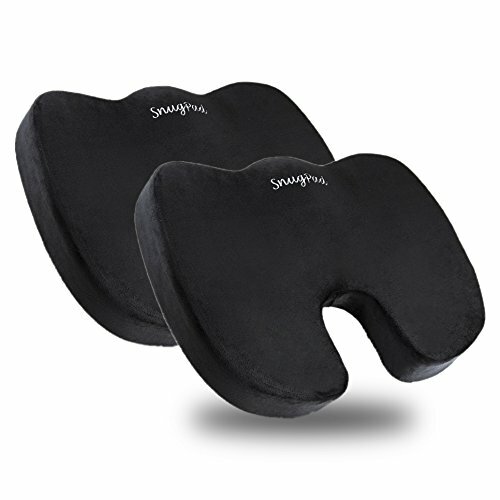 IMMEDIATE BACK PAIN & SCIATICA RELIEF - The SnugPad Coccyx Seat Cushion is specially designed to provide ultimate support and comfort, while reducing pressure on the tailbone and coccyx, and encouraging healthy posture. The cushion helps to support with recovery from lower back problems, herniated discs, pain stemming from sciatica, tailbone damage, pregnancy back pain, hip pain, hemorrhoids and any other spinal issues or discomforts. PERFECT FOR DRIVING, TRAVELING & OFFICE CHAIRS - It is designed to distribute weight and promote increased spinal alignment and proper posture. It offers immediate relief and comfort on any hard surface, car seat, desk chair, wheelchair and more. It is perfect for frequent travelers and office use! SATISFACTION GUARANTEED - We offer a 30-day satisfaction guarantee. If you are unsatisfied, simply contact us to return the product for a full refund. If you have any questions about this product by SnugPad, contact us by completing and submitting the form below. If you are looking for a specif part number, please include it with your message.